On Jane the Virgin Season 2, Episode 8, it's Mateo's first Christmas, but Jane and Rafael struggle to remain civil. Meanwhile, Petra confesses everything to Rafael. When you watch Jane the Virgin Season 2 Episode 8, Jane and Rafael bicker as Mateo's first Christmas approaches. After almost getting lawyers involved, Jane and Rafael come to an understanding in therapy. Jane knows she will eventually forgive Rafael, but her thoughts are still with Michael. Michael, his partner, and Luisa discover Luisa's mother faked her death and swapped her identity. Petra's anxiety over Magda killing Ivan raises her blood pressure. She confesses everything to Rafael, who wants to help her. Too late because Magda already turned on her daughter and got her arrested. Rogelio struggles to replace the bromance he had with Michael, but discovers his intern wrote an amazing script. Alba finally gets her greencard. Jane learns Rogelio was behind her now defunct scholarship. Her professor helps her land a T.A. position. 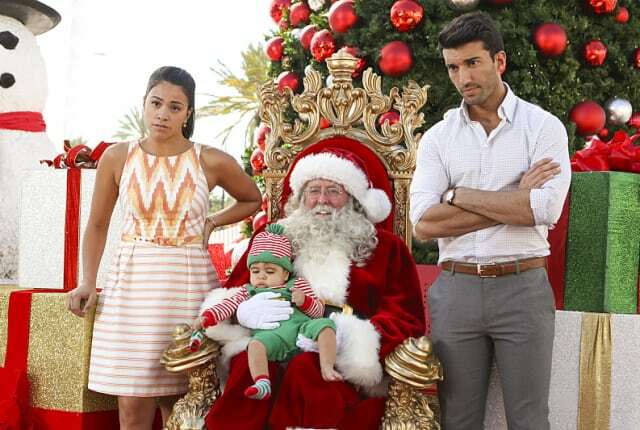 On Jane the Virgin Season 2 Episode 8, it's Mateo's first Christmas, but Jane and Rafael aren't getting along. Meanwhile, Petra's mother betrays her. Santa: Ho. Ho. Ho. No fighting at the north pole. Jane: Stay out of this, Santa. Permalink: Stay out of this, Santa. Petra: No it's not. I can still see the blood. Narrator: Easy there, Lady Macbeth. Permalink: Easy there, Lady Macbeth.